Add One© was developed in collaboration with vets. It is a tasty cat treat that contains not only a fresh portion of creamy salmon sauce, but also omega-3 and plenty of moisture. The high moisture content can also be good for the cat’s kidneys. In addition to being extremely tasty, Add One© was designed to make an excellent mixer for Porus® One. The problem with feeding dry feed is that cats often refuse to eat the recommended supplements because they don’t combine well with the dry feed. 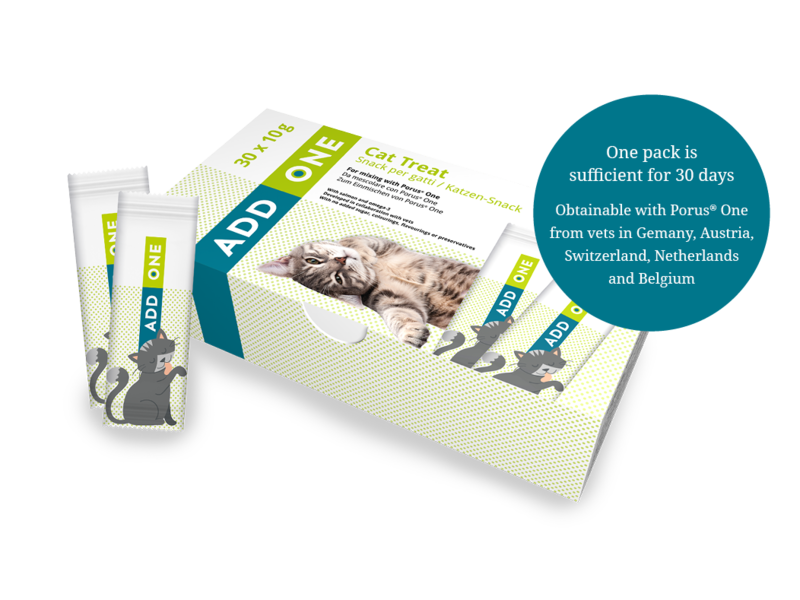 Add One© can be used as a supplement the cat will accept by first mixing Porus® One into Add One© and then offering the mix to the cat before putting down the dry feed. Tests have shown that this works well with Porus® One and that cats will happily eat Add One©. Add One© is so tasty that cats also enjoy eating it straight from the stick – as a treat for in between or every day – because it is low in calories (less than 10 kcal per stick) and contains no added sugar, colourings or flavourings, and also no preservatives.